Summer may not officially begin until June 20th (so says the Farmer’s Almanac) but we all know that Memorial Day weekend marks the actual beginning of the summer season. That’s when we all try to squeeze into our bikinis for the first time of the year, dust off our croquet sets, and gas up our motorboats or inflate our inner tubes. Summer’s first weekend of festivities deserves a fresh batch of beer. So we’ve curated the ultimate Memorial Day Weekend Six Pack, chock full of brand new beers. Don’t worry, this isn’t one of those super saccharine fruited IPAs that may or may not give you a pre-diabetic condition. Sweetwater takes it easy with the pineapple in this killer IPA, showing some welcomed restraint in a world overrun with fruity beers. Sure, there’s some pineapple on the nose and the sip, but it’s a mellow adjunct that adds just the right amount of sweetness. 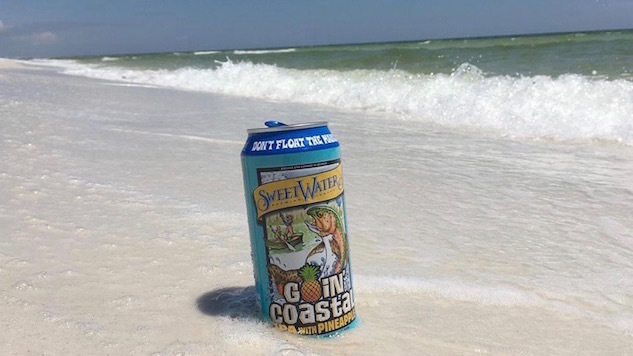 Part of Sweetwater’s limited Catch and Release seasonal program, you can find the 6.1% ABV brew in 12 ounce bottles or 16 ounce cans. It’s Memorial Day, so go with the Tall Boy cans. Your cooler doesn’t have to be stocked entirely with lagers this weekend. There’s room for something a bit off-center, like this new beer from Dry Dock, which promises to balance the sweet with the sour. Tart, effervescent, and full of fresh apricot, the new beer is now part of Dry Dock’s year-round series. Thankfully, they’re releasing it in cans starting this week, just in time for the big weekend. Okay, this isn’t a new beer at all. It’s been around since ’97 and has helped define what a West coast style IPA means today. But for the first time, Stone is releasing their signature IPA in cans. This is about as excited as I’ll ever get over a piece of aluminum. And it’s just in time for Memorial Day. It’s 6.9% ABV (so be careful) and available year round, of course. Burial is a small brewery in Asheville’s South Slope that’s managing to make waves, especially since they began canning recently. Ceremonial is built for summer—a 4% ABV session IPA, with just the slightest bitter bite, but dry-hopped for maximum citrus aroma. And it comes in big boy cans. Look for it on shelves now. Consider this the beer for your fancy Memorial Day party. This saison was brewed with lavender, bay leaf, marjoram and chervil for an herbal, earthy nose and taste. I don’t know what chervil is, but whatever, it’s Dogfish, they know their herbs. And they released it earlier this month, on the anniversary of the Reinheitsgebot, because as president Sam Calagione put it, “we have always believed this law is nothing more than a relatively modern form of art censorship.” You can find it in fancy bottles all over, but be careful, it’s 8.3% ABV.